This is just one of hundreds of custom name pendants we have created for happy customers. No matter what it is, we are able to turn your idea into a stunning piece of custom jewelry that you can’t get anywhere else. Let us shatter the myth that custom jewelry is either expensive and or difficult to have made. As a custom jeweler that’s been reinventing the custom jewelry game since 2008, we don’t follow trends—we set them. Explore our Custom Name Necklace collection and discover how Valeria Fine Jewelry can create a gold and diamond Custom Name Necklace design differently for you. All it takes is a click to contact us! There are numerous ways we can take name or words and turn them into something to wear around your neck. We can make cutouts or we can extrude the words off of a back. Or like in this third eye blind name necklace, we can can put fill the background with black enamel. Shorty Smooth wanted a “smooth” pendant to wear every day. We weren’t sure what that meant, but we chose this font and put it together in a way that was cool, yet still durable. Custom work is our specialty: it is what we do best and what we love doing most. We can always buy something from a mass manufacturer and sell it to you, but where is the fun in that? We would prefer to create something that nobody else has and that you can’t buy at the mall. Whether you’re looking for custom gold grills or your next iced out name necklace. We pride ourselves on manufacturing high quality custom jewelry using the highest quality materials. We also have with fast turnaround times, with the average name necklace taking 10-16 days if there aren’t 300 stones in it! Work with us to transform your ideas into reality and we will create a stunning name necklace that captures the imagination of everyone who sees it. No idea too big, no detail too small: let us design your dream. You normally think that a Name Necklace is horizontally oriented. But that doesn’t always have top be the case. We took this customer’s initials and cascaded them downwards to give this monogram pendant a unique look. Let us put a beautiful Name Necklace around the neck of a loved one or even yourself! Create your own Name Necklace with our experienced pendant designer to show your unique personality, celebrate an milestone, or tell a personal narrative. Whether you know what you want or just have an incomplete idea for a stunning piece of jewelry, we’ll design and cast the perfect Name Necklace for you. We weren’t told the reason behind this custom pendant, but it held enough meaning to our customer that he had us create it. It was in silver and the “A”triangle had a bezel set round black Diamond in it. We can use one of hundreds of fonts or create something totally custom for your tastes. We can also add stones for some sparkle and or color as well. Enamel is another option for customization and the addition of color. 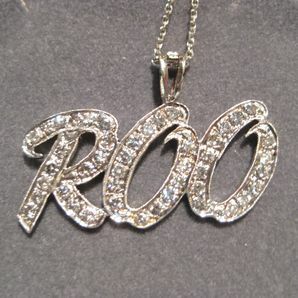 This “ROO” pendant is just one of many Name Necklace designs that Valeria Fine Jewelry can create for you. Using the latest CAD software, we is virtually create our designs before casting them using the lost wax method. The resulting piece of custom jewelry is something that you won’t find anywhere else and one you will see and approve before it is cast and finished out. Having a Name Necklace or any piece of custom jewelry made by Valeria Fine Jewelry is a more highly involved experience than if you bought something from a big box chain store. We do whatever it takes to make sure each customer feels special and that his or her wishes will be more than met. As a result, we hope and expect that you will be a repeat customer for life. No topic or theme is off limits at Valeria Fine Jewelry: nothing can offend us! The Fuckem pendant was for a customer who wanted to let the world know what he thought of them! As long as the piece can be cast and is durable enough to be worn, we will create it for you. Well…it has to be legal as well. This diamond name necklace was commissioned by a British hip hop group of the same name. They had the name, but no logo, so we created one for them using broad brush strokes. Then we covered those strokes with diamonds. The result was a Custom Name Necklace that can be seen sparkling on the necks of the group by fans in the crowd. Distance doesn’t stop us from building relationships with our customers. Contact us today for competitive prices, creative custom designs, and stunning quality. We create unique Name Necklace designs specifically tailored for to the taste of the individual. If you can imagine it, we can create it. And we guarantee that you will love your pendant because you have to approve the design before we cast it. This promotes collaboration, which we have found always results in a better final piece. A talented designer, Lucas has more than the creative eye and talent for jewelry design. He spent years in fabrication classes at the Craft Guild of Dallas, earned his GG from GIA, acquired connections to reputable diamond and gemstone dealers around the world, and gained overall insight into the world of jewelry. This has turned him into a trusted source for custom jewelry that is high quality, yet fairly priced. Click HERE to see more of our custom pendant designs. Click HERE to learn more about custom jewelry or to contact us with your idea for a custom pendant. It can cost less than might think to have your own custom necklace created for you. What are you waiting for? ?